Hottest October day in Britain since records began, and, while of course utterly delightful as we potter gently, surely more than a touch alarming as evidence gathers of irreversible, and for us humans, sooner or later disastrous climate change. Our selfish hope today as we potter gently south from Rugby to our absolutely favourite canal village of Braunston, is that the collapse that’s coming holds off long enough for the canals to stay filled up with water and for boats to have space, diesel and leisure to enjoy this magnificent network for a few years yet. After the excitement of the past week (excitement? Gentle amusement perhaps a better description), this last weekend of homeward pootling is largely uneventful, though as we line up behind the first of two triple sets of weekend locks behind three other boats (all piloted by friends in their late 70s who since April have been right up to the north of England together for long, long summer of cruising – proof just how long one can keep doing this) there’s a moment of what might be termed canal rage. A very, very long residential boat driven by a middle-aged gentleman with a very, very long pony tail comes up behind the Molly May as if to pass us in the locking queue, and I gently point out that we’ve been waiting for a while already. The response is very sharp admonition – clearly assuming that we’re novices at this – that we should have positioned ourselves closer to the locks. I take umbrage. 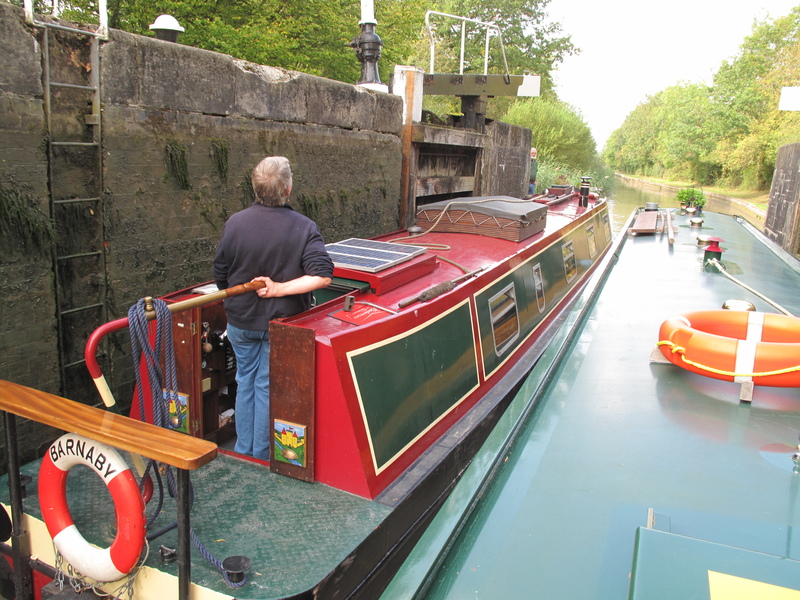 Partly at being told off by someone who hadn’t seen why I had sensibly positioned our boat where she was – three other boats ahead of us before the lock, and you don’t get close! – but particularly at the assumption that, because Molly May looks like a hire boat, I obviously don’t know the rules of the canal. Fisticuffs are avoided, but as the other boat turns in the winding hole and huffily sets off in the reverse direction, it’s been a reminder that not all canal users are signed up to the same set of polite manners and friendliness that’s marked all our many trips on the canals so far. The Braunston moorings when we get there are quite superb – best to tie up just before the two characteristic iron bridges that span the turnoff right into the Oxford canal – and the Old Plough Inn in town, under new management, does us a creditable supper and a pleasant pint of real ale before we bed down for our final, and longest night of the trip. What is it about sleeping and the canals? Sue and I average at least 10 hours a night on the Molly May, and love every moment of the oblivion. Stress falls away like scales, and by the end of the week, what with the locking and the resting, the good food and the outdoor air, we’re feeling formidably refreshed. 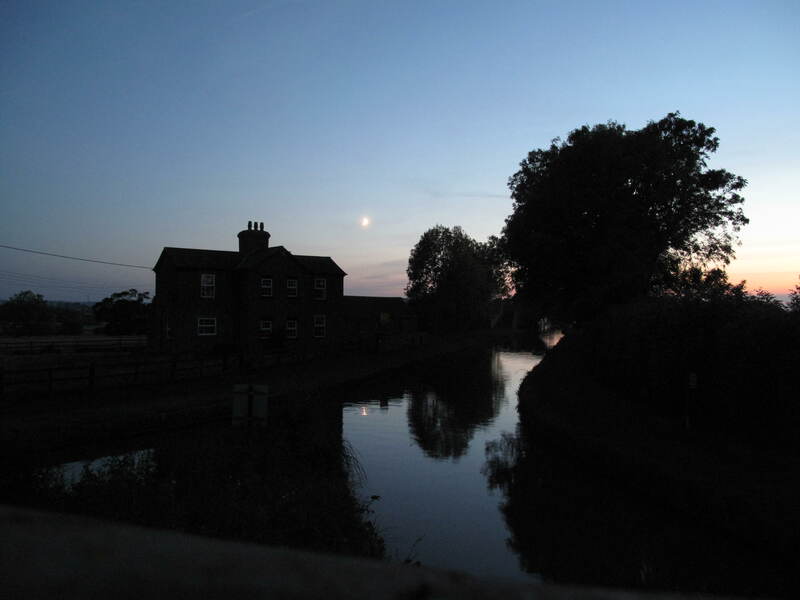 And, with this moonshine view of Braunston Junction (the canalside house, by the way, is at the time of writing for sale) looking forward to our next excursion.